New filling materials have been available for quite some time but, in many dental practices, amalgam remains the norm for dental fillings. 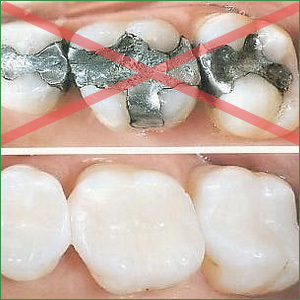 Not only are metal fillings unsightly, they contain mercury. Mercury is a controversial product. While it is a naturally occurring element, it is a toxin and some believe it can cause environmental and health issues. Additionally, some patients react to the metal fillings and they can expand and contract with exposure to hot and cold. This constant movement creates spaces between the tooth surface and the filling leaving your tooth vulnerable to decay. Over time, this movement can crack the tooth causing it to break apart. Modern materials have now largely replaced the need for older style fillings and have the double advantage of being safer and more natural looking. Reactions are rarely seen with white fillings because they contain no metal. Composite fillings have little to no movement, cracking and breaking rarely occurs. This type of filling bonds well with the tooth surface, preventing bacteria and food from becoming trapped. Invasive procedures are not necessary to repair your tooth with a white filling. Tooth colored composite fillings closely match the natural color of your teeth, unlike metal fillings, which are silver and very noticeable. Most will never know you had a repair done on a tooth filled with composite material. Get those metal fillings out! At our Santa Monica dental office, we utilize natural products at every opportunity and prefer to keep invasive procedures to a minimum. All of our plastics used in composite fillings are BPA free for your health and safety. Less removal of healthy tooth (less drilling!) because the composite fillings are bonded directly to your tooth and do not require your dentist to drill a hole for the filling to sit in. After your amalgam fillings have been safely removed, we will prepare your teeth for porcelain onlays or composite fillings and restore your smile with durable, natural looking porcelain. Dr. Brightleaf strives to find the best dental solutions for her patients to provide them with a better quality of life.